Casey is hiding again—in Memphis this time—but it’s different now. She knows without a doubt that Dylan believes her and is doing all he can to help bring Brent’s killer to justice. He’s become an unexpected friend . . . and even, maybe, something more. Hope makes everything more bearable. Casey makes a deal with the DA to turn over all the evidence she and Dylan have gathered against Keegan and Rollins—only to discover that the DA is in league with them too. After a desperate escape, who can they possibly turn to now? Time is running out for Casey, but master suspense writer Terri Blackstock will keep readers on the edge of their seats until the last, utterly satisfying page. Terri Blackstock's If I Run series comes to it's thrilling conclusion! If I Live finds Casey Cox still on the run, but getting ever closer to capture. Dylan Roberts, on the other hand, is nearer to compiling compelling evidence against the detective who wants to kill Casey for her silence. Casey Cox's story has captivated me since the beginning. She's a woman on the run from the police because she was accused of not only her best friend's murder, but a few others she's crossed paths with. Since discovering Keegan's extortion ring, and evidence that her former cop father was murdered, Casey has enlisted the help of the private investigator sent to bring her back to face murder charges. Dylan and Casey forged a tight bond during the previous story, If I'm Found, as he persuaded her to look to God for strength and guidance during her trials, and helped her deal with the PTSD that has developed from her situation. As they are closer to bringing Keegan's circle of terror to an end a romance is blooming between them, and they wonder if the feelings could last if life returns to normal. The main characters are as real as ever. There's even a deeper insight into Keegan's dark motives and a look at how far it's willing to go for greed. At so many points throughout the story I willed myself not to jump ahead for the need to know what was about to happen to Casey. 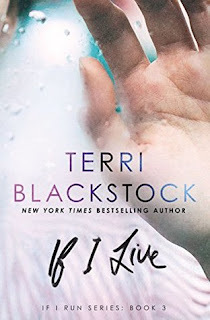 If I Live is a heart-stopping addition to the series. Terri Blackstock excels at building suspense and carefully constructs a fast-paced plot that compels you to marathon read to the finish!